Lopez is the comedian’s third show since ABC cancelled George Lopez in 2007, the first Latino program to have a syndicated afterlife. 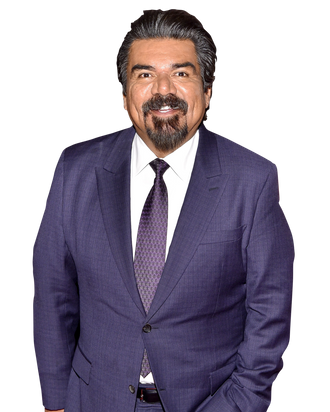 Although all of his work is autobiographical — on his ABC sitcom he explored his tormented relationship with the grandmother who raised him, and on FX’s Saint George he covered his life as a newly single father — Lopez plays himself more substantially in this single-camera comedy. Of course, race comes up (Lopez, it turns out, has “white-man problems”), but Lopez is more about people and character than themes or ideas. Lopez, who says he’d love to keep this gig for four or five years, spoke with Vulture about the time he threatened his neighbor to “put a Mexican in the trees,” Snoop Dogg’s slow work process, and why he’s dredging up humiliating moments in his own life. You’ve made a multi-camera sitcom with an audience and then a sitcom hybrid without an audience. Now you’re trying the single-camera format. Why did you want to do this? Well, I like TV more than I like doing movies because in the movies there’s so much waiting around. That kills me to wait. On Saint George, I learned a little about how different it was than multi-camera. But to be able to go outside and shoot around L.A., to have L.A. be the studio, that was great. You’re shooting some of it where you grew up in San Fernando. Yeah, we shot in my old neighborhood. To be able to go back to the neighborhood and have some guys there that remind you of where you came from, and then you have scenes with the manager and the consultant telling you where you’re at now, I think it’s a great place to be stuck in the middle of. How do you find the single-camera format as an actor? Do you think it gives you more freedom? You know what, I liked it because they’re almost like 12 little movies. Because of the way that Troy Miller shot them, it’s always moving. The stuff in the car is great. It’s not still, you know? There’s not really a lot of sitting around and talking. How realistic is the conversation with your representatives about all the social media demands and all the different accounts you have to maintain now? Oh my God. Social media. I think it’s gonna turn on itself. It’s so destructive, 24 hours a day. It’s not always nice. I don’t really look at Twitter that much anymore. I don’t look at Instagram. I only look at Facebook. I think it’s destructive because it gives people 24-hour access to be negative. Most of the stuff I get is negative stuff. That’s when I know that I’m doing better than I was doing before, when it’s more negative than it had been. Because when you’re not doing anything, nobody is really connected to you because people follow so many different people. But when you have a show, then the clips go out and somebody will say, “I’ll give it one season and then it will be cancelled like your other ones.” And I’m not complaining! It’s just all of the stuff that you have to go through to be able to do your work now. Angelenos will get a kick out of seeing former Mayor Antonio Villaraigosa getting confused for a valet parker — by you! Oh, yeah, he’s great. About a year ago, we shot a production pilot and he was in it and then he did it again this time. But he’s better in this one than the first one. The first one he was good too, but when he says pendejo [slang for dumbass] both times, it is really funny. Yeah, we’re friends. The TV Land office called him and they couldn’t really nail him down. And then I called him and I went out to dinner with him and I nailed it down. So it’s just a personal touch. Snoop Dogg, too. You know, Snoop Dogg, when I did my talk show, Snoop had come in and we became friends there. He’s so good because he’s Snoop, you know? Estaba fumando [he was smoking] marijuana all afternoon, and I waited three hours and then he came out. He smoked weed all, all day! I love that idea that he calls you over so you can entertain his maid. That actually happened to me a couple times so I decided to put it in. Another actor asked me. I was at a Christmas party in Bel Air and he said, “Hey, can you talk to my housekeeper?” And I was like, “Yeah? Uh, yeah.” And I talked to her. I’m like, “Hey, cómo estás?” “Mis nińos son fanáticos.” [My kids are your biggest fans]. “Oh, que bueno.” [Oh, that’s good]. “No puedes pasar poor la casa?” [Can you stop by the house?”] “I don’t know.” And then he gets on the phone and he goes, “Hey, she said you’re gonna go by the house.” I said, “Oh no, I didn’t say I was gonna go by the house.” He goes, “I think it’d be great if you went by the house.” I was like, “I don’t know if I can go.” And he goes, “Well, here’s the address just in case. I mean, you’re gonna pass right by it.” I didn’t stop. I guess you don’t want to disclose who that was? Some of the jokes poke fun at some deeply personal things. There was a joke about divorcing your wife after she donated her kidney to you, and that time you passed out on a casino floor. Why are you bringing that up again? Well, it’s all on public record, but it’s never come from me. And I think just to set it down and say, that’s that. Listen, I’m not embarrassed. You’re embarrassed when it happens, but it’s all part of your life. So if you’re gonna be honest, then use it to be honest. Anything else, I think, would ring false. When you were thinking about the show, were you thinking it would work better on cable? Yeah, because of the landscape. There’s not a lot of places on network TV, and I don’t think network TV is the first option anymore, you know? Like it was in 2001, when I was doing the first show. Cable wasn’t as big as it is now. And there wasn’t Netflix and other places. And with being able to watch it on an app, on your phone, it’s ridiculous. Even the DVR looks dated when you can have it on your phone and you can watch it at any time. I talked to ABC a little bit about some stuff. You just want to go where they let you do your stuff. TV Land is changing its image. It’s got Jim Gaffigan, and it’s got Hilary Duff’s Younger. So they’re trying to change the vibe of it, get less sitcom-y and more into the single-camera thing. They were very supportive. They leave you alone to be creative. And if they have notes, we address the notes. So it was a great place to do the show. I’m not sure I would’ve had the same freedom unless I would’ve gone to Showtime or HBO. It hasn’t been that long since your show was on ABC. But the industry has changed so much. It seems like a dinosaur now. Do you find this time exciting? Yeah. I mean, so much has happened. I’m gonna be 55 at the end of April. And so much has happened in the time that I’ve been alive. From the record to the eight-track to the cassette to the disc to nothing. And then in TV, from five channels to cable, HBO, On Demand, to all this now. Almost anybody can be on TV, which is gacho [messed up]. But, still, I think the talent and how good you make the show still works. That hasn’t become old-fashioned — having talent. Would you agree that this is the first show where you play more of yourself? I’m more playing me than I was playing an actor playing me. No, I liked it. And I’ve offered stuff where they would say, Oh my god, that’s so great. The housekeeper one nobody knew about. Rescuing the dog and then have the dog not connect to you is real, too. When a dog doesn’t connect to you, you’re like okay. Has your daughter watched the show? I don’t think so. My daughter and my ex-wife, they don’t mind all the trappings that come with success. They just hate to be made fun of. But that’s how we made the money. And it’s not them. It’s versions of them. Have you really been trying to date online? Unsuccessfully. I don’t want to see anybody twice. I just want to see them once. (Laughs). I really don’t want to see anybody twice. Lopez premieres tonight at 10 p.m. on TV Land. This interview has been edited and condensed.